Swiss-style cheese prepared from goat’s milk. Swiss-style goat cheese made with 100% pure Dutch goat’s milk. 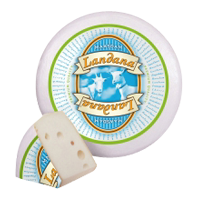 Landana goat cheese MAASDAM has a mild and somewhat sweet and nutty taste. Delicious on bread, but also particular tasty on its own.